There was a movie based on the book?! I didn’t know that. I read the book previously. It was intense and very inspiring. This is an excerpt which my friends would relate to very well. Haha. It is a high ideal indeed and hard to believe that any Architect would dare destroy a Developer’s building! But do watch the whole clip. or ‘mu-dan-hua’ is one of my favourite flowers. 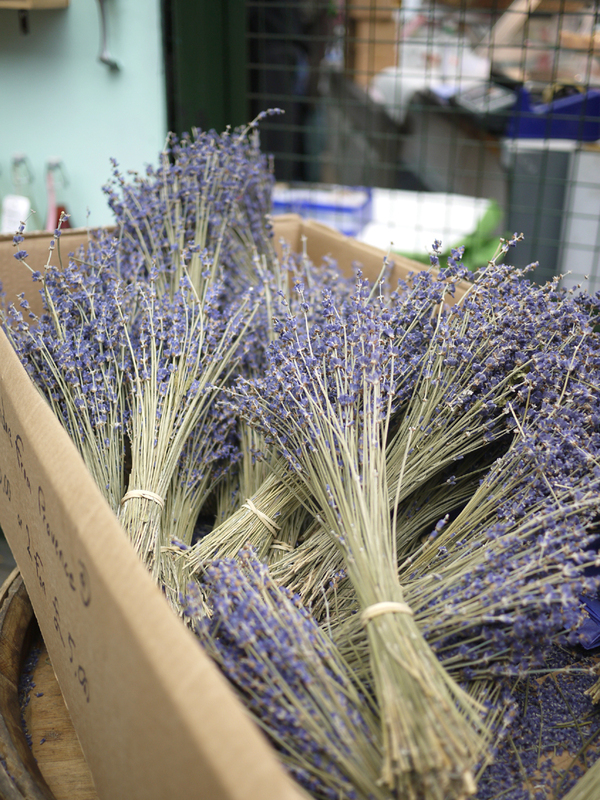 They were in season 3 weeks back and can be bought in the market for 10 euros a bunch. 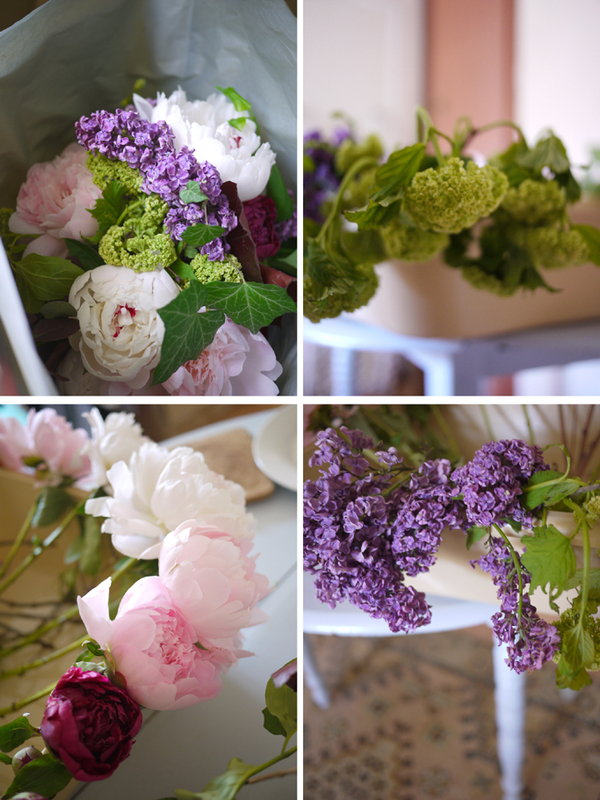 Each time I pass the flower stall at the market, I would stop to admire the flowers there. So beautiful! I would love to buy the deep dark red peonies that I had used for my wedding bouquet but I just couldn’t bear to part with 10euros! 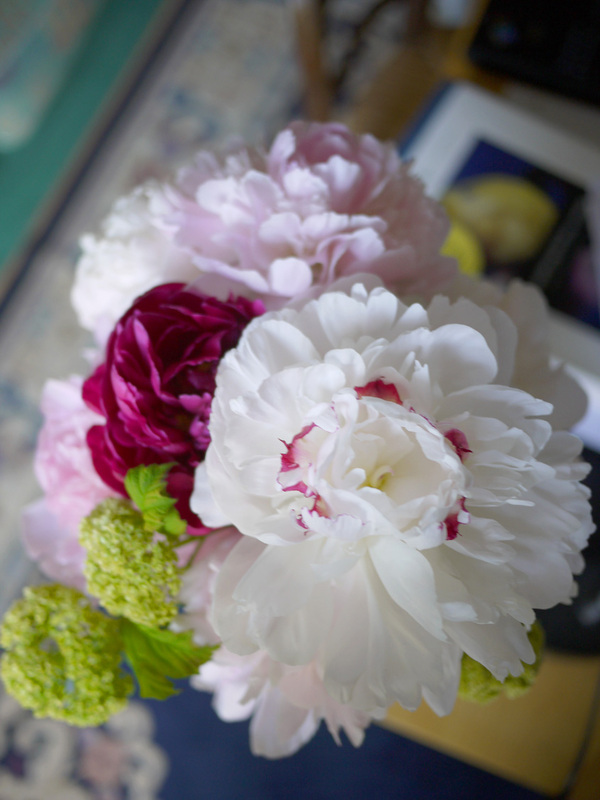 However, I hosted a dinner last week and our wonderful friend, Yoshimi-san assembled a beautiful bouquet using peonies and flowers from her garden! I was elated! I had no vase that was large enough to hold the bouquet so I had to disassemble it and rearrange them into 2 smaller vases. I would have loved to keep Yoshimi-san’s assembly! So sorry! 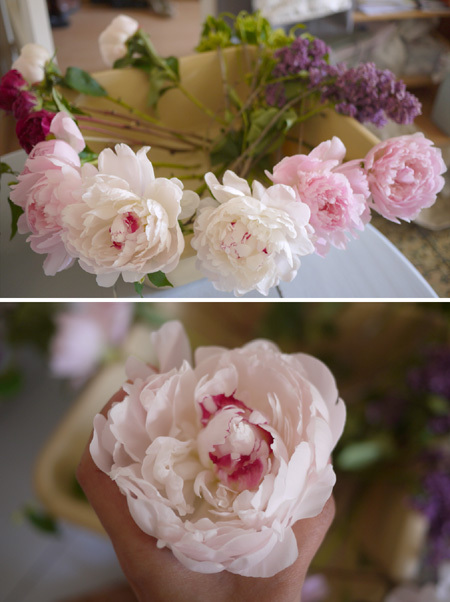 Peonies are so soft and delicate. I was pretty worried that the petal would all fall out by the time I am done! It’s wonderful seeing the flowers bloom into different stages each day. They never remain the same. 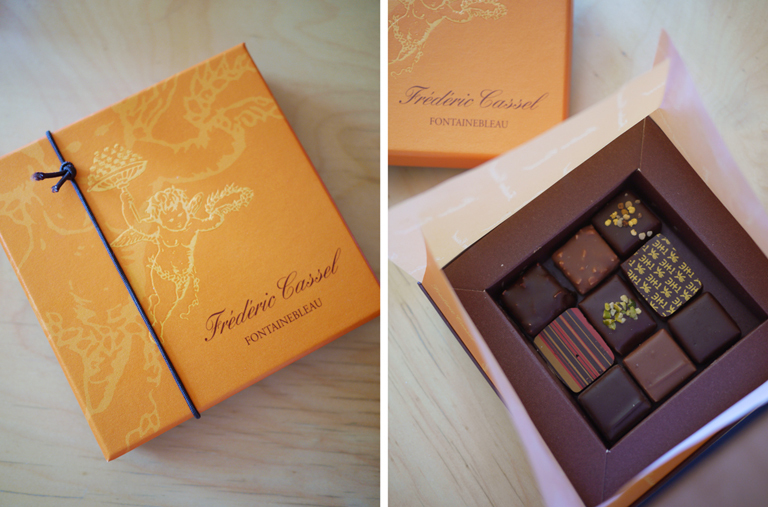 Yoshimi-san also got me a box of chocolates from Frederic Cassel, a famous chocolatier in Fontainebleau. It was so good! I was really sad to leave London. I missed the company and the fun that London has to offer. I’m sure there are more nooks and crannies to explore! Yes. Impressions do count. I was wowed by King’s Cross St Pancras Station. They had a big Marks and Spencers Supermarket with an amazing array of sandwiches, salads, fruits, sweets and drinks! I had a hard time choosing! Btw, did I mention that London is big on organic food. I was glad to see every ingredient labeled with ‘Pasteurized eggs, pasteurized cheese, free range eggs, organic bread’ etc. 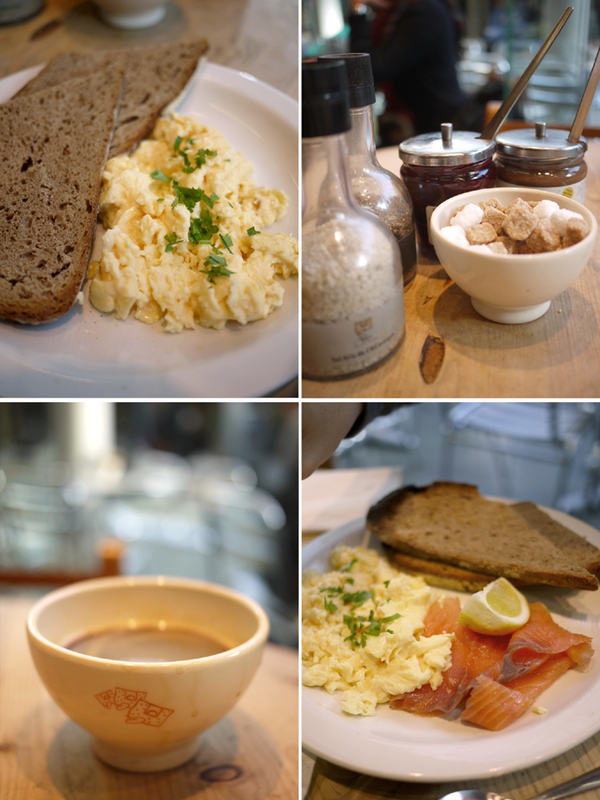 After our grocery shopping in M&S, we took our breakfast in LePainQuotidien cafe and had a really nice scrambled eggs on toast! A nice end to our short London trip! A big THANK YOU again to J and G. You had been wonderful hosts and we loved your company! We look forward to making your stay wonderful too if you do decide to drop by France! Another Big Breakfast but a BIG disppointment this time. 202 located along Nottinghill, was overpriced and the food was bad. My bacon and sausage were burnt and it was worst than the humble Carluccio’s that we went yesterday. W’s bagels and smoked salmon was so-so. 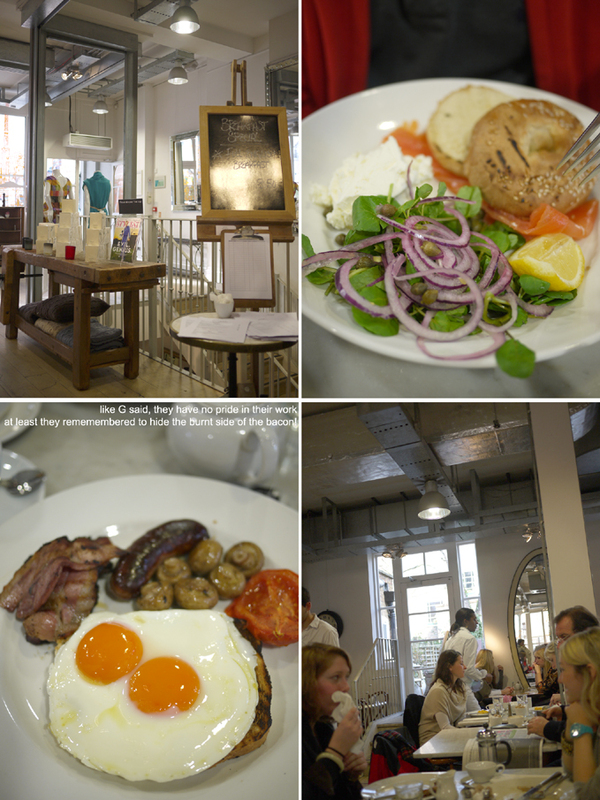 It looked promising with ‘Timeout London’ writings, a crowded cafe and cool interiors. But I guess this is like our PS Cafe in Singapore where the food cannot justify its cost! Sigh. Tom’s Deli (should have tried this instead!). Read reviews here and more pics here. Apparently Tom is Terence Conran’s son. Portobello Street Market was packed with people on a Saturday morning! It was selling lots of antiques and vintage items. Dotted along the street were cafes to rest your feet. 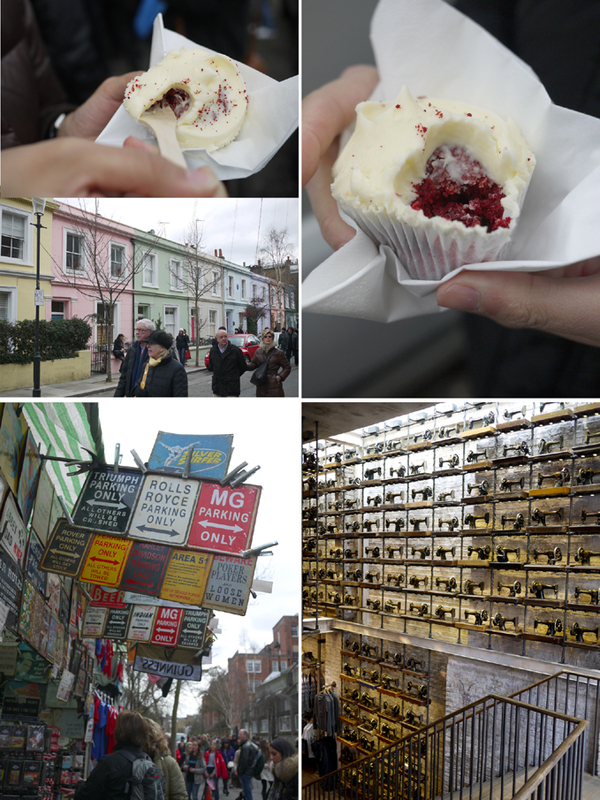 We chanced upon Hummingbird Bakery and was wondering what the fuss was about. CUPCAKES in creamy turquoise, pink, baby blues, pale yellow and chocolate sprinkled with colorful hearts and stars! So pretty! I got the ‘Red Velvet’ and it was lovely! 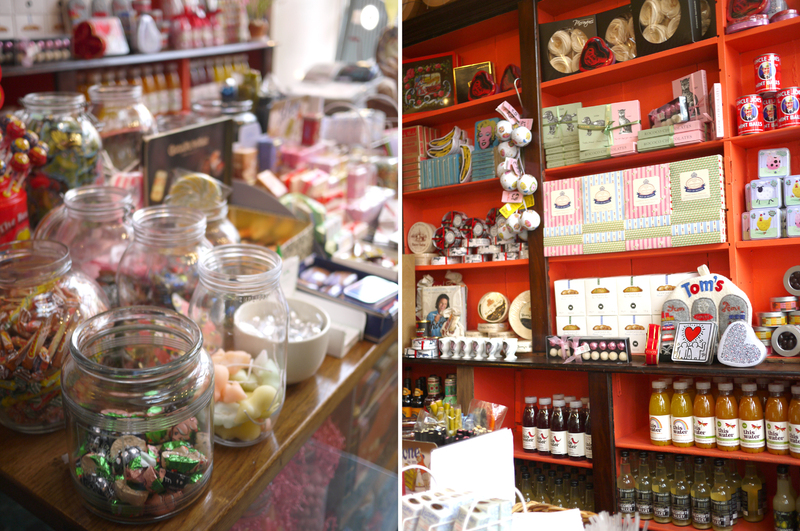 We met up with our friends at Paddington and made our way to Pearl Liang. Dim sum for lunch! I had been craving for dim sum and was delighted to find authentic food and soft egg tarts! Thank you guys for bringing us there!!! After lunch, it was back to Oxford Street for W and me. It was crazy. Oxford Street was packed with people on a Saturday Weekend! After a nice chat over tea with QT and XH at Marks and Spencer’s Cafe, we parted. W and I made our way to St Martins in the Fields to meet J & G to catch Vivaldi’s Four Seasons. By the time the wonderful performance had ended at about 9pm, our tummies were growling and we ended up near our apartment for some award winning Lebanese Food at Alwaha Restaurant. We were fortunate to catch the last order for dinner. I was hungry and the food was so good that I forgot about taking pictures! It was an awesome trip. I had been to London twice but this is the best experience ever! I loved every minute of it. Despite my growing tummy and shifting centre of gravity (backaches! ), I was bouncing with energy. Helps too that the weather was great. We had 2 sunny days and another day with just occasional intermittent showers. YEAH! I woke up feeling like an excited kid looking forward to my 1st school excursion. Not sure if its the hormones! 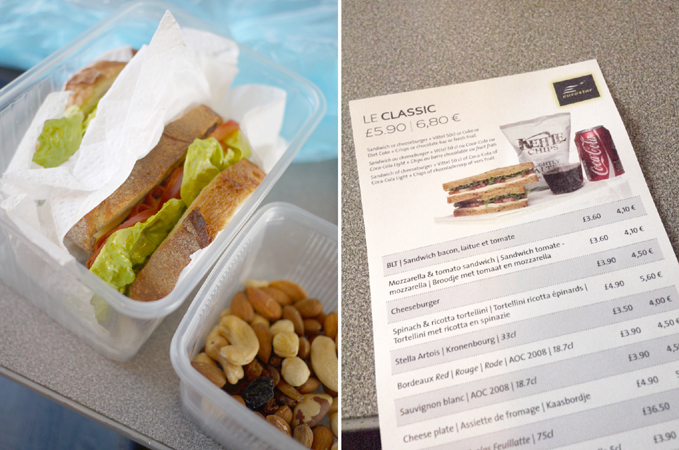 I made ourselves sandwiches, roasted some nuts and we’re off to catch the 8.30am bus! I was real glad to have prepared the sandwiches. 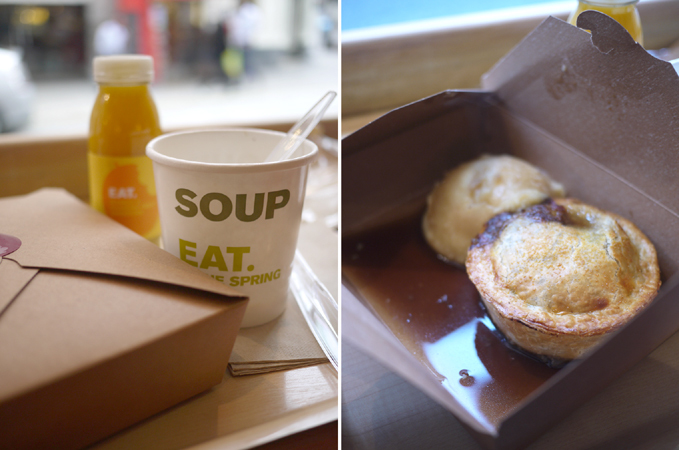 It was yummier and cost just a fraction of the ones sold in the Eurostar! We arrived at Gare de Lyon and took another train to Gare du Nord where Eurostar is located. The customs process to board the Eurostar was quick and efficient. I was ecstatic to hear the English language! No more ‘Bonjour’ or ‘Merci’! It makes a huge difference when you could understand what the world was talking about! There was no itinerary and we were bunking in with our friends in Central London. (Thank you so much J and G! You are so kind to put us up!) Our sole objectives were to relax and meet up with friends. After a comfortable 2.5hr ride to London’s Kings Cross St Pancras Station (Central London). We arrived at 12.30pm (London Time). Since we are meeting our friends at 7.30pm, we decided to grab some lunch before catching the musical ‘Hairspray’ at Holborn. We were glad to find these cool sandwich shops in Britain. EAT. It was the ‘pies with mash and gravy’ advertisement that drew us in. But I preferred the Chicken and Leek soup. Heh. Hairspray was my first musical and I was bowled over. Coordinated dance moves and beautiful stage sets. Not to mention the powerful singing and marvelous acting. The entire crowd was standing, clapping and shaking their booties at the end of the show! If I could dance, I would have loved to join! Apart from the boisterous fun, there were sweet moments in the show too. I was touched when a white girl and a black man were apprehensive about their relationship due to racial segregation, the black man’s enlightened mother reminded that ‘Love is a gift from above, but people forget that’. Yes indeed. The opportunity to meet someone you can live with for the rest of your life is a gift from above. Beautiful. We finally met up with our friends at dinnertime and they brought us to an amazing cafe, Bonda Cafe, that serves Malaysian food. We had Fried Rice and Char Kway Teow and the dishes indeed have ‘wok hei’ (fire from the wok)! We would have ordered more food if not for the long wait. After meeting up with The Client in Telok Kurau, I would pop over to Joo Chiat Place to get my favourite ‘kim choo ba chang’ or have a bowl of ‘fei fei wanton noodles’. That was how I came across these interesting works lining along Joo Chiat Place. I love looking through the windows, doors and at the balconies. They say so much! Joo Chiat area is a very old estate that is growing popular with the younger crowds. Going by the several A&A works that are going on and the cool upgrading of old properties, I am sure the property prices in the area are increasing as well. Argh. I particularly liked the dark brown unit on the ground floor (bottom left pic). There are some interesting art works within which I was tempted to ask the owner about but too shy to approach them. Haha. Note the sensitive take of creating a door perpendicular to the road instead of facing the road directly. Nice. THIS is really really cool (above pics). I could not have imagined doing up a shophouse in this way. Check out the landscaping too. Brave. This unit is next to the shophouse mentioned above. I thought the entrance facade has alot of character. Or maybe it’s the bench & motorcycle combi. I like it when the owners personalise the walkway with lots of landscaping and appropriate lighting. Throw in a bbq pit and the look is complete. Hehe. Thought this was funny. The only shophouse left standing like the movie ‘UP’? THIS is what I had been busy with. A simple but extremely fun job. Nothing like the mega problems that came with the institutional building I did previously. Ironically, because of the small scale of things, there are A LOT more minute details to consider and it fills my mind practically everyday. User requirements, preferences, habits and the suitability of the design to its users. Working out details. Understanding materials (which I’m still learningt). Furniture and fittings’ form, color, texture, durability, suitability to the climate all require thinking through. I think this is all about balance. How do we achieve balance? Check out this article. Do you agree with the article? As for me, I am in the process of working it out. Stay tuned! 2 more rooms to go! EXCITED! Just realised I didn’t name the product that got me the muji book prize in the previous post! The product that garnered the highest vote was the ‘Muji Legless Chair’! I remembered the competition didn’t state whether you had to vote based on the Japanese Community or our Local Community. But since it was the most ‘Japanese’ product on the list, I decided to choose that. It was a culture shock for me when I first saw them in Ryokans (left kamikochi’s nishi-itoya; right kinosaki’s nishimuraya) in Japan. But since the Japanese sit on floors, I thought this was a great idea. The chairs were pretty comfortable too! A little search on the muji website revealed a new model of the legless chair which I thought rather interesting. You can use it in many ways which is pretty versatile for a guest room. I wish Muji was cheaper. Sigh. Won a muji prize recently for voting the most popular product listed in the Muji Ion Exhibition. Yep, I am a muji fan. Hehe. I rarely do lucky draws because I NEVER win! But. The less than half empty transparent lucky draw box meant that the probability of getting a prize would be high. On top of it, I wanted the prize book so I tried my luck. I was soooo happy when I got the letter informing me of my win. I went immediately the next day to claim my prize! I kept the book in its wrapping so that both W and me can unwrap it. Haha. The book chronicles muji since the 80s and its development in product design. Nice. After collecting the prize and W’s Mogo Mouse (another cool product), it seems pretty apt that we popped over to 15 minutes in LaSalle Arts School for dinner. The fish and chips (S$12.90) was great and the Affogato (S$5.50) was really good! We ordered the Lychee Soda (S$4.90), Watermelon and Feta Salad (no watermelon and feta!?) and Prawn Pizza (S$9.90) but I think you can skip them. I recommend going for lunch instead because prices are much lower (fish & chips at S$9.90). Good fish and chips, cool ambience, low prices (for a restaurant setting) and 1 for 1 happy hour for heineken beer before 8pm will make us go back again! A beautifully executed place isn’t it and done by local architects as well. Yeah! Check out the CCTV camera concealed above the light. Neat huh. Hehe. Throughout the 12 years of school and professional life, I never thought that I could ‘sketch’. In fact, I just bought a book ‘Sketching Interiors – a Step by Step Guide’ followed by a shopping rampage (quite fun though) for pastels, kneading eraser, sketch block and fixative but gave up after several failed attempts. Haha. Don’t get me wrong. It’s a really good book that teaches some basics in drawing and which I intend to master still. BUT when I think of modifying and re-sketching the image, just because of ONE material change, I cringe. SO. I steeled myself, sat down and went through the entire online tutorials, fiddled with the buttons and created my very first 3D model via Google SketchUp (and on MacBook Pro too). It is really amateur but I feel accomplished nonetheless; and NO I am not attempting any high level renderings. I’ll leave that to the experts. This is good enough for me. Heh. Off to borrow ‘Google Sketchup for Dummies’ from Central National Library.